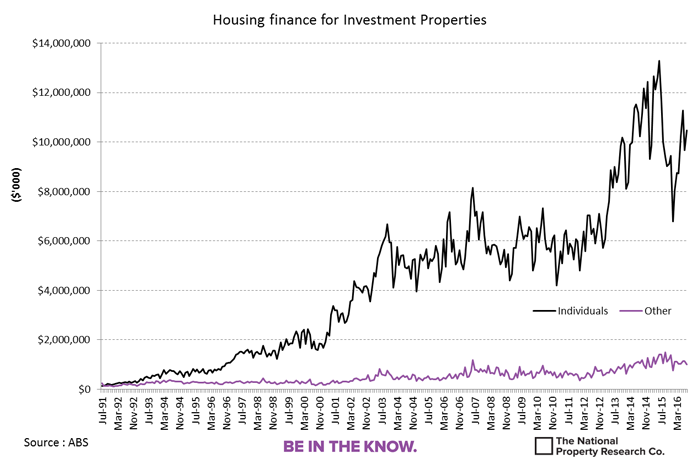 Since mentioning The National Property Research Co.’s tweet on the definition of stupidity a couple of days ago we have looked at financial markets and the US property market. As we discussed in today’s Weekly Wrap podcast, yesterday we saw the headlines that Corelogic’s latest report showed Melbourne apartment prices crashing 3.2% in November and housing down 1.5% in general as early indications of stress in the broader property bubble. 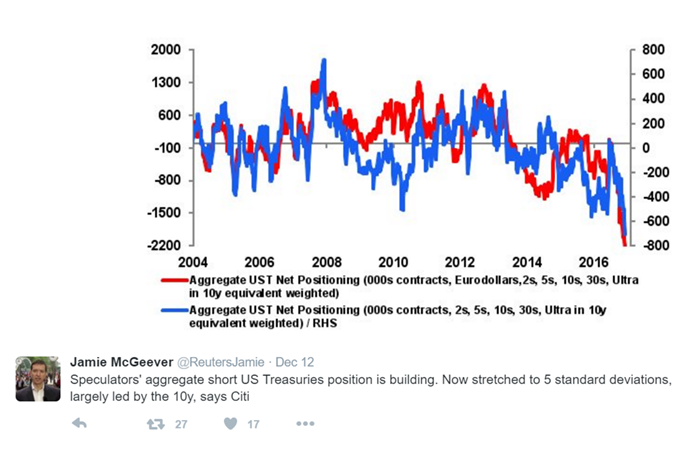 On the shear amount of supply coming on…. The big question is how all that investment debt handles increasing interest rates (courtesy of bond prices collapsing around the world and talk of central banks tightening) whilst supply is surging, rental yields contracting, and prices looking to be topping. The following chart should be at the forefront of investor’s minds. 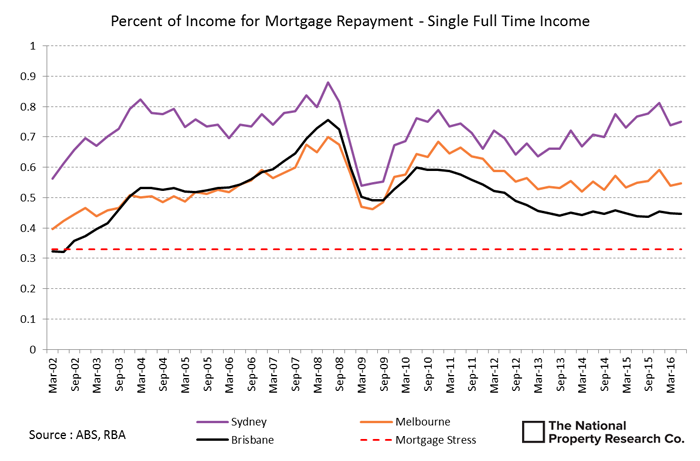 It shows the staggering amount of debt held by Aussies and how low interest rates have held the real cost of interest below previous peaks. Should the aforementioned march of bond yields and expectations of central banks starting to raise rates play out, the interest on the record high debt pile could be devastating. 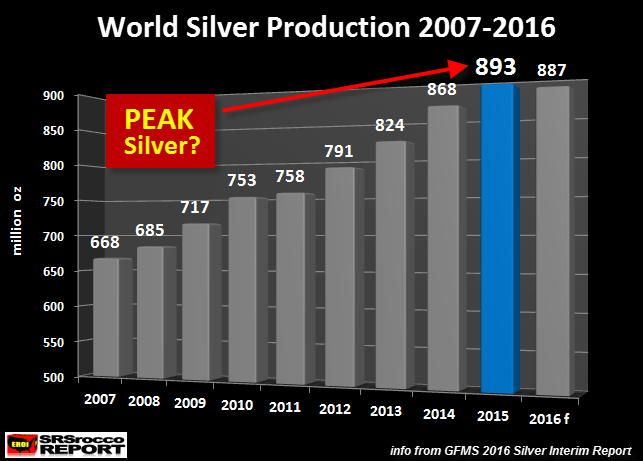 We have written before about ‘peak gold’ and now mining analysts Thomson Reuters GFMS have presented evidence and a forecast to support that silver production peaked last year. The chart below illustrates that now with advanced estimates for 2016 showing a decline on last year to reinforce those previous forecasts. Those deficits are courtesy of strong demand outstripping supply. Indeed we have seen deficits since 2004 and 2016 is on track to be the second biggest, beaten only in 2008 in the throes of the GFC. The chart below illustrates this. This year saw the silver price surge, up into the mid 40%’s for the year with huge inflows to ETF’s accounting for 133m oz (to Sept). The correction after this may well see this number reduce but it shows the impact of a decent rally in investment silver demand. 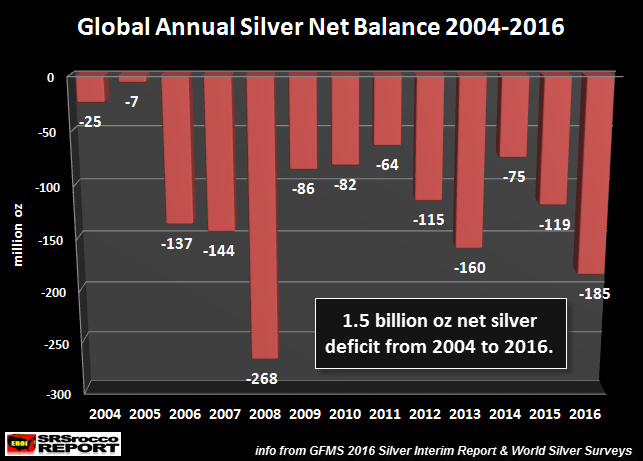 As the graph inset states, since 2014 there is a cumulative 1.5 billion oz silver deficit. Whilst the surpluses of the 80’s and 90’s have ensured adequate supply to date, with declining supply, growing industrial demand and all the reasons for investing in silver alive and well, it foretells a shortage to come. This however could well be way beyond such short term market machinations in the now all familiar ‘central banks to the rescue’ narrative the market has come to rely on. This is yet another example of the populism/anti-establishment phenomena that saw Brexit and Trump and to an extent our Senate. The No vote came in a huge 5% above the polls at 59%, voter turnout was 10% higher and the No vote was stronger in the more disadvantaged regions. Sound familiar? Italy, and indeed much of the EU, needs serious economic reform. Italy’s economy has stagnated since entering the EU and its government debt risen to 133% of GDP, the second highest after Greece. The most recent poll has 48% of Italians wanting to leave the EU. Italy is the 3rd biggest economy in the EU. Should it leave, no amount of ECB bond buying will fix that. 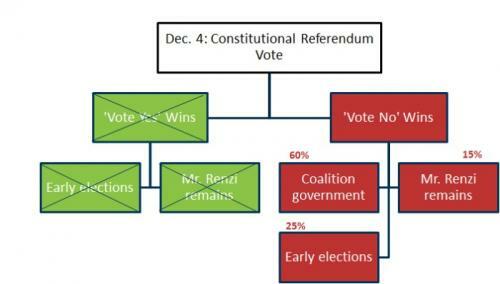 Goldman Sachs have updated their flowchart and odds on ‘where to from here’ now we know the result. It’s a precarious situation. Shares Pumped, Gold Dumped…What Gives? Gold surprised a lot of people after the Italian referendum by only briefly rallying before falling more heavily. Likewise shares, even in Europe rallied after an initial fall. What gives? We think there are a few things at play here. Moreover there appears to be a fundamental-less, self-reinforcing, everything is awesome euphoria in ‘risk-on’ markets that sees every event as an opportunity to buy a dip rather than see it as something structurally wrong. Italy was exactly that. 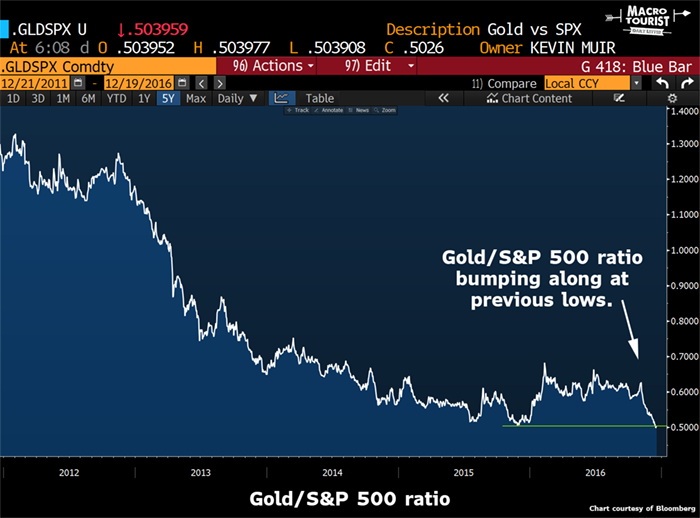 We are also starting to see a tangible disconnect again between paper and physical gold markets. 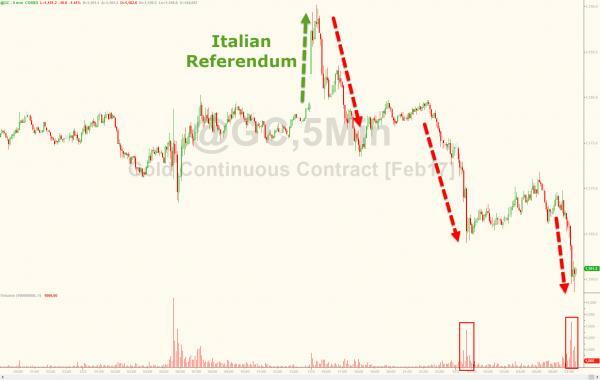 The chart below shows the action on the COMEX futures exchange before and after the Italian referendum results. What you are looking at in those 2 big volume spikes down the bottom is around $4.7b in notional value of gold, or around 3m oz of paper gold, sold in a matter of hours taking the price down to a 10 month low. We won’t know until the COT report this weekend but would wager it is the speculative Managed Money sector dumping gold into the clever hands of the Commercials as they chase this awesome ‘Santa Rally’ sharemarket. That physical demand has seen premiums paid over the spot price in China rise to their highest since April 2013 and Indian’s have been paying around US$1700 amid a spot price dancing around US$1170! The ‘brisk’ US demand he speaks of has seen US gold eagle sales post their highest month all year in November, the 4th straight month of increases, and are now sold out. So to recap we have US shares hitting all time highs on hope based euphoria and gold hitting 10 month lows despite rampant physical demand. Which do you think looks the better buy? We reported a month ago that changes to Islamic law could make gold an acceptable financial asset to hold for the first time. Bloomberg this week reported that this did indeed happen, being approved on 19 November (but announced just Monday) after negotiations between the Accounting and Auditing Organization for Islamic Financial Institutions (AAOIFI) and World Gold Council. The report states there is US$1.88 trillion in Islamic finance business that can now invest in gold. Whilst yet to be confirmed, it appears this will likely include investment in ETF’s like GLD. The move potentially opens avenues for Islamic central banks and also commercial banks who may use it to meet Basel III liquid asset requirements. To quantify this in demand terms, if just 1% of the Islamic Finance institutions funds were deployed into gold it would increase demand by 500-1000 tonne per year in a market that sees around 4000 tonne of current demand and already inadequate supply. It could be quite extraordinary. There are 1.6 billion muslims worldwide, and as we reported yesterday, this potential new demand comes at a time of growing physical demand from China and India. 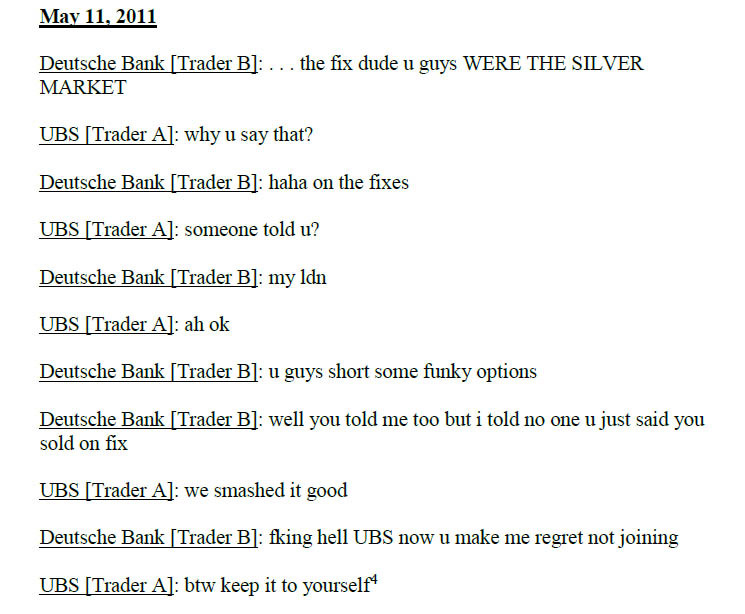 Silver Manipulation Exposed – Curse or Opportunity? Of course the silver and gold fix rigging is incredibly small in scale by comparison to the LIBOR fix scandal that saw nearly $8 billion in fines to banks manipulating it last year, over $3b of that was to Deutsche Bank again. Whilst cold comfort to anyone who had to sell their silver during these periods it should come as good news that this may well be stamped out for current owners and potentially still represent a once in a lifetime buying opportunity as well. It’s probably coincidence but silver has demonstrably outperformed gold since this was released with the Gold:Silver Ratio dropping from 73’s to now just 68.7 at the time of writing. As a reminder, that is still a LONG way off the circa 45:1 100 year average, lows of 30 in 2011 and 18 in 1980. We wrote about the GSR here when it was 83 just before it topped at 84 earlier this year. Fed Rate Rise This Week – Repeat of Last Year? After months of speculation and growing expectations, this week is the week of the, now, almost certain US Fed rate rise. In a repeat of this time last year gold has been under pressure in the lead up to it, with big falls on Friday night and closing down 1% for the week. There other similarities to last year too. On the COMEX futures exchange, from Saturday’s Commitment of Traders (COT) report we are seeing the speculative Managed Money traders’ net positions drop to their lowest since January this year, before gold’s big rally started. Long positions dropped for a fourth straight week and this week shorts increased as well. Whilst still net long (banking on a rise), it is the lowest since January and the Commercial’s on the other side of the trade are at their lowest net short position since January too. It is a contrarian’s dream set up. The difference to last year is that gold has been arguably more oversold given the mid year highs it has come off and shares are more overbought with the Shiller CAPE PE Ratio for the S&P500 up at a nose bleed 27.7 with only the 1929 Black Tuesday and all time champ Dot.com bubble going higher. The other key issue is the USD rally which has the Managed Money long in a very big way, again its highest net position since January but in a more overbought manner. We also have the background of sharply rising bond yields courtesy of the post-Trump bond sell off. What this latter point might mean is that the market itself has delivered higher interest rates before the Fed even got to it. Very different to last year. The accompanying higher USD is already hurting the US trade balance and economic growth (as we discussed in last week’s Weekly Wrap). So whilst the Fed could not possibly avoid the hike this Wednesday with any semblance of credibility, they may deliver it with very dovish statements to try and counter this destructive rising USD. That could well deliver a significant counter trade that could see the USD drop and gold rise. There is always the ‘buy the rumour, sell the fact’ outcome as well. Last year we had to wait for January for markets to realise the ramifications of a Fed tightening amid record US debt, weak fundamentals and simply massive Emerging Market USD denominated debt. That may not necessarily be the case this year. We’ve addressed previously the erroneous direct comparisons between Trump and Reagan. Apart from agendas of tax reform and fiscal stimulus, the environments could not be more different but they may have one common link – a recession within 12 months. “After considering the chart above, even the most optimistic among us would say that Trump and his economic team face some strong head winds. And I haven't even touched on the BIG macro problem facing the U.S economy, which is an avalanche of global debt. Making things even far more difficult for a Trump administration is that in the last 100 years there has never been a two-term presidency end that wasn't followed, within 12 months, by a recession. But we do live in interesting times. And it's possible that the world's central banks will make good on their promises to double down on their experimental economic policies in a way that will kick the can down the road on a recession. So let's say that Trump's policies work. The U.S. economy is still a big ship to steer: It doesn't just turn on a dime. Large government-funded infrastructure projects take time to get started. Time for the funding to come in. Time for the projects to be planned. And time for the equipment to be delivered. That's why sometime in the next several months, I expect the uncertainty factor that the President-elect and his policies bring, to "trump" the recent market euphoria. 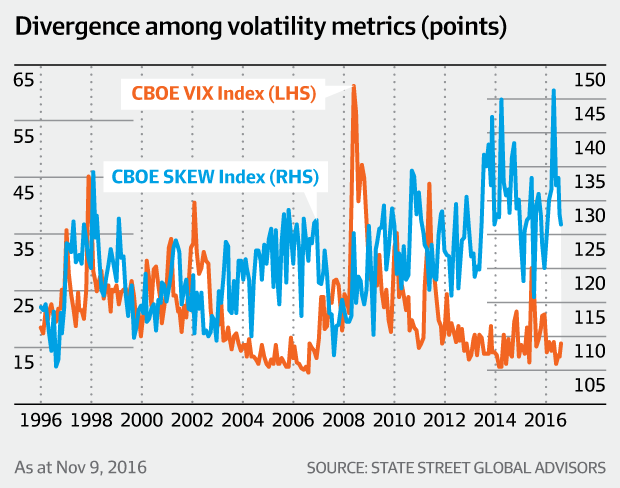 And in the financial markets, uncertainty equates to volatility. The other safe haven to Treasuries of course is gold. To us it seems a little counterintuitive to be piling in to US debt instruments at a time of volatility in, specifically, US markets after such an unprecedented lead up to the next crash. By that we mean there has never in history been a bubble more over inflated by government stimulus than this one, and that is even before the ‘doubling down’ that Jim refers to (be that helicopter money or negative rates in the US etc). When this thing pops many believe it will completely dwarf the GFC and Great Depression. In terms of value, real, fundamental, intrinsic value, gold has no peer. A US debt note (Treasury bond) held as a safe haven in a debt borne crisis on the other hand….? The AFR describes a Black Swan event as “something that no one has thought of, but which, if it happened, would rock the markets for the next 12 months”. We often talk of exactly this… they are the unknown unknowns as Mr Rumsfeld would say, and when a system is as strung out as this one is, their number and implications are huge. SSGA who put that graph together said: "as the current equity bull market is poised to enter its eighth year, it is apparent that investors are willing to pay in order to hedge tail risk". The SKEW is in effect insurance that you buy, but from which you can profit or at least maintain wealth. You may have heard of another form of insurance you can buy, but one that is a hard asset with no counter party risk, is no-ones liability and is uncorrelated to shares… gold. You may recall the table of the last 5 biggest crashes on the ASX v Gold in those same years. ASX down 24.4%, gold up 38.5% - gold holders 63% better off. Visit here to see the table. We included a graph here in a previous article showing how gold is generally uncorrelated (negative correlation) to shares. 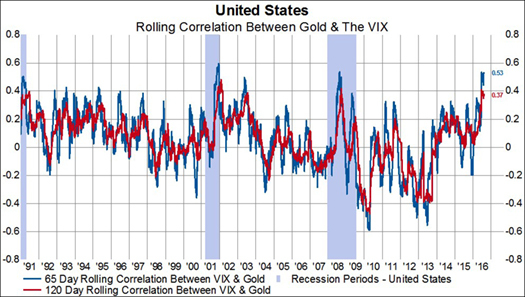 The following accompanying graph shows how positively correlated gold generally is to the VIX. Note the divergence (negative) at the height of the post GFC monetary experiment/stimulus in the US, but now back to correlated and looking very much like those other shaded recessions… The problem is the VIX signals are often too late, its spiking when that brown stuff is already flying off the fan. The SKEW on the other hand sends a clear message. Are you listening or is everything awesome? Last night the US Fed raised rates for only the second time in 10 years. Despite being a ‘sure thing’ the 0.25% rise saw the biggest sell-off in shares since the election and along with them, bonds and gold were beaten down also. 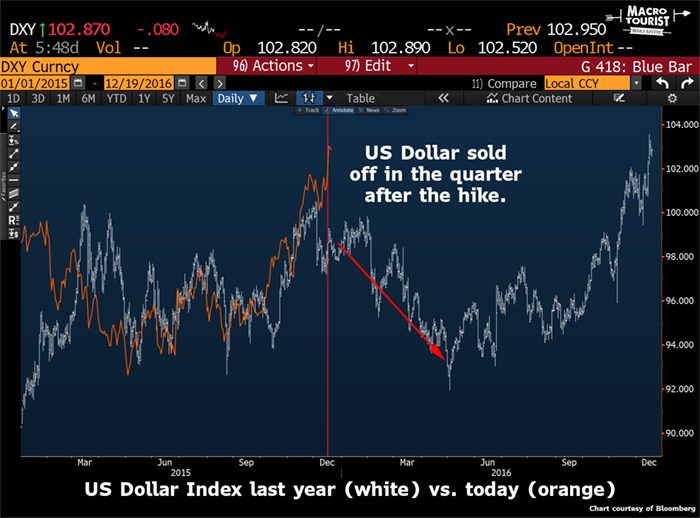 The USD was the only (predictable) winner and that saw weakness in the AUD and buffered out all the gold losses for us. Silver ended up stronger. That stronger USD could start to play havoc with US business growth and Emerging Market debt stress. This, like last December, may be the first ‘reality check’ for the Trump Trade. The second may be near. From the day the Trump based rally started we’ve warned of the realities of getting all that ‘promised’ stimulus and accompanying debt through Congress and the legacy thereafter. It’s where euphoria meets reality. Well, more than a month before he is even inaugurated Senate Majority Leader, Mitch McConnell, has signalled that stimulus is unlikely to get through if it is going to add to the already huge (around $600b) deficit and US debt pile. From a Bloomberg article he “poured cold water on the idea of a massive stimulus package, effectively laying out markers on taxes and spending that that could cramp Trump’s ambitions." and that he "warned he considers current levels of U.S. debt “dangerous” and said he wants any tax overhaul to avoid adding to the deficit." The US already has nearly $20 trillion in government debt (before including unfunded liabilities of around $100 trillion <see here>) and the Committee for a Responsible Federal Budget estimates Trump’s fiscal stimulus promises would add another $5.3 trillion in just a decade with deficits in the order of $1 trillion per year for the first 4 years. As we’ve reported previously too, Goldman Sachs calculate there would be no impact on the economy from all of this until 2018. For a sharemarket in its 8th year of expansion and the 3rd longest and 3rd most overvalued in history, that could well be a bridge too far. ‘The general idea that public capital and infrastructure will boost economic growth is a prominent feature of government economic programs across the world. ‘The econometric evidence reveals small positive and instantaneous associations between public investment booms and economic growth, but little long run impact. Several aspects of the evidence cast doubt on the idea that past booms triggered or accelerated GDP growth. Most of the positive association occurs immediately; a spending boom tends to be immediately associated with a rise in GDP this year, but not subsequent years. “If infrastructure spending actually worked, Japan would be the poster child in this regard. Instead, it’s a basket case. ‘[Japanese] Prime Minister Shinzo Abe’s “bold” plan to revive the economy with a $273 billion package leaves him traveling down a well-trod path: it marks the 26th dose of fiscal stimulus since the country’s epic markets crash in 1990, in a warning for its effectiveness. So we have the double whammy of a sharemarket rallying on the hope of stimulus that may well be blocked, or at the very least watered down by Congress, and of which history tells us there is no lasting economic benefit regardless. Rather, we get an even bigger debt pile to overwhelm and collapse the economy instead of just letting markets be markets and, God forbid, have a recession every now and then, reset, and continue. 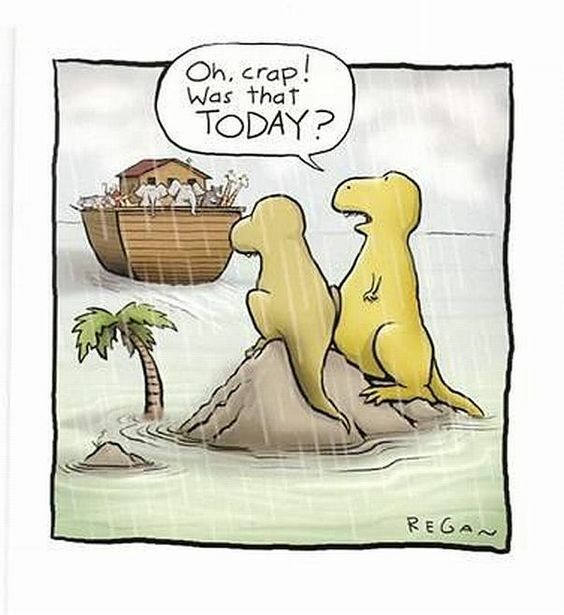 Regular, natural recessions have happened for centuries and we’ve survived. This obsession to prevent the next one at all costs, could well be creating an economic, and indeed social, collapse of unprecedented proportions. Ouch… silver took a hit last night. It had held up beautifully all week against the Trump-phoria and USD surge with the Gold Silver Ratio getting down to 67’s. That all changed last night when it momentarily hit a USD15’s handle, down a full dollar and a GSR now of 70.6. As you know its not just gold and silver taking a hit at the moment, bonds are being heavily sold too. Both are victims of the ‘everything’s awesome’ narrative we spoke at length about yesterday. If you haven’t read yesterday we (humbly) think it’s a must read. At the moment ‘EVERYONE’ is short bonds and to a lesser extent gold and silver. 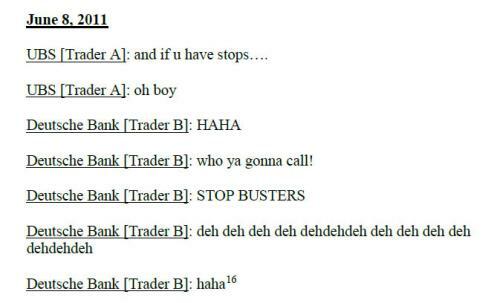 Contrarian traders look for such setups as we have here. When the sheeple pile ‘all in’ in one direction, history shows those who look at this a little more objectively and bet against it can make huge gains, as the ‘flock’ turn en masse. Please don’t get us wrong, we’re not saying put everything on black when ‘they’ are on red… Just spread your chips so you don’t leave the house broke with the rest. To finish this analogy, the above chart suggests red just won 5 times in a row, everyone is on red again… what’s your bet? You’d have to be living under a rock not to have heard or seen the headlines about Australia potentially losing its AAA credit rating. At midday today our Treasurer releases a mid year budget review that many tip will see an even bigger Government deficit and debt pile. Already being on negative watch we then run the very real risk of losing our AAA rating accordingly. What will likely ensue today is just a whole lot of political mud throwing and focus on government debt. Whilst that government debt and fiscal performance is no doubt the cause for the potential downgrade, it is the personal debt that doesn’t seem to be getting the attention it deserves, and could be the biggest effect. We don’t hear enough in mainstream media about the fact that Australia has the highest personal debt to GDP in the world. We also don’t hear enough that we have now over $1 trillion in foreign sourced debt. Whilst our government debt to GDP is modest by most western standards, it is the personal debt that should be front and centre of this AAA downgrade talk. A downgrade sees a loss of confidence and increase in the cost of all that foreign debt. That then flows through to loans on our already strung out property market where last week we saw declines in price growth and indeed price losses in many markets. This coincides with falling rental yields and all time historically low wage growth. 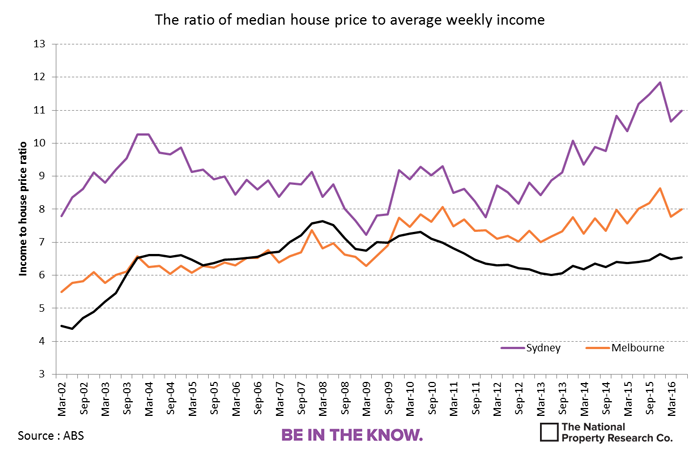 So to point out the obvious in that equation, prices rises have stalled or negative (particularly in apartments) in some markets, interest costs will be going up, and income (servicing that debt) is reducing or stalling…. The AAA credit rating loss could be the start of a wakeup call that has been coming for some time. You will probably hear today that other major economies don’t have a AAA rating but they may forget to mention they have nowhere near the personal debt nor ‘all in’ bet on their property market like we do. In the short term they can print money to service their higher government debt, but we don’t know many mums and dads who have a money printing press or tree. Is the Silver Market Cornered? There is a bit of speculation going about that the silver market has effectively been cornered. You may recall the famous Hunt Brothers’ move on silver where they and some business partners effectively cornered the silver market by buying up around 130m oz from 1973 to 1980. That holding accounted for over 40% of the (then) global annual production and drove the price up from $3 to $50 over those 7 years. "This year, JPMorgan has taken delivery of more than 6,000 net silver futures contracts (contracts stopped minus contracts issued), all in its own proprietary trading account. That's more than 30 million ounces of silver acquired by JPMorgan, most of which eventually found its way into the bank's COMEX warehouse. The big theme, as I see it, is JPMorgan becoming more aggressive in acquiring physical silver and gold while at the same time reducing its COMEX short position in each almost as aggressively. It's hard to imagine a more bullish backdrop for futures prices." Last we read, he has their physical holdings in the order of 300m oz. Their current holdings (as at 16 December) is 1,898 tonne or around 60m oz. As with gold the Chinese like to buy the dip and you can see they took the foot off as the silver price got crazy this year but are firmly back in the game now. That they increased their holdings by over 700% in less than a year shows how quickly this can happen. The other big player, as we’ve reported during the year is the ETF’s and non bigger then SLV. During the year, holdings sky rocketed to 11,270 tonne (350m oz). That number sold off a bit in the big correction we are currently experiencing but nowhere near to the extent of gold. Ted Butler maintains this was a big source of J P Morgan acquiring physical too. And of course J P Morgan aren’t the only participant on the COMEX and they are in the Commercial category too. The Commercials are still net short silver and the speculative/hedge fund Managed Money category is now again near a peak net long position. They’re back. 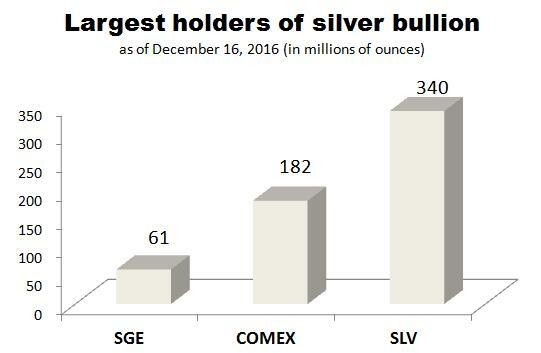 Looking collectively at these 3 and you see that they are around 66% of forecast 2016 silver production (887m oz). That makes the Hunt Brothers (at 40% at its peak) look decidedly underweight. With 50% of silver used in industry, 66% takes on a whole new meaning from a supply & demand perspective too…. As we reported yesterday it was a year that was set up through the US Fed hiking rates for the first time in 9 years and confident of more to come in 2016… Whilst that happened in December 2015 it set the stage for the biggest financial markets fall in a new year in history (the S&P500 down over 10%) which in turn saw gold and silver take off as their historically negative correlation often sees them do. 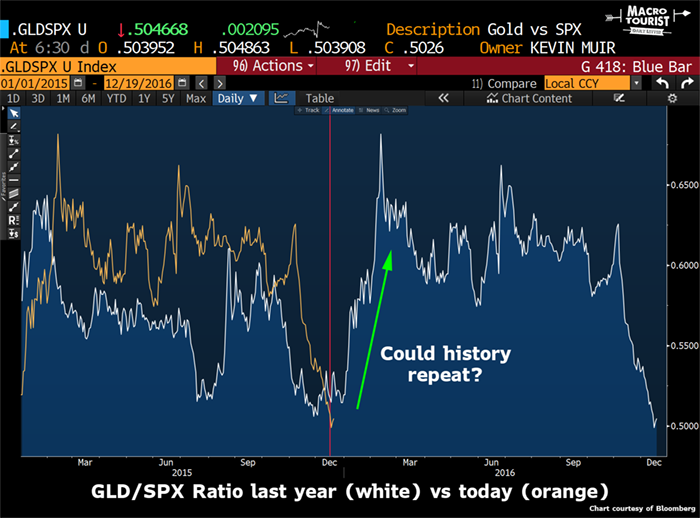 Gold was the first out of the blocks and we saw the gold silver ratio (GSR) hit a long term high of 84 in February. But from there, as the ‘GSR sling shot’ came into play, silver shot up peaking at $27.11 in August, up 43% since the beginning of the year. Gold was no slouch either, peaking at $1818 in July, up 25% for the year. At it’s lowest the GSR hit 63 before finishing at 71 as silver retreated more than gold. The theme for that first half of the year, even in mainstream media, was a loss of faith that central banks ‘had this’; a growing belief that all the monetary stimulus wasn’t working and indeed could become destructive. Of course there was the small issue of Britain leaving the EU in June that saw things take off again after the January / February market meltdown. When the world didn’t end shortly after and markets realised this was a process not an event, they rebounded strongly and gold and silver started a gradual declining trend thereafter. What Brexit did however was awake the world to the extent of the anti establishment and anti globalisation movement. Most post-mortems of Brexit concluded it was clearly about that, and not whether the UK should be in the EU. Apparently it wasn’t enough of a wake up call as the polls still had Clinton as the likely victor in the US Presidential race but again Trump showed very clearly the level of discontent with the status quo out there. Everyday people are feeling screwed over by the rich getting richer on all this stimulus and them going backwards, together with the impacts of globalisation. That was soon followed by the Italian referendum with the same result and drivers. What probably wasn’t expected was the extent to which the market ‘bought in’ to the Trump promise of economic prosperity and its impact on gold. Most expected gold would surge on a Trump victory with all the geopolitical and economic uncertainty he brings to the table. And surge it did… for less than a day. Just as shares tanked and gold surged on the realisation he was going to win, on one acceptance speech devoid of blunders and talking up unity, tax cuts and fiscal spending the market about faced and went ‘all in’ on risk again. Everything was now suddenly awesome. US shares surged to new highs and gold fell. The irony of markets all of a sudden trusting the promises of the same man they derided for policy inconsistancy and lies, and accepting at face value both his ability to get $5t more debt through congress and without consequences was nothing short of staggering. And yet hope is a wonderful thing and something the US hadn’t felt for some time. Hope however is not a good investment strategy and we are yet to see euphoria meet reality. At home it was a year notable for growing concerns around our property bubble as the RBA dropped our rates to the lowest in all history and Aussies took on more personal debt than any other country in the world per GDP, mostly in property. 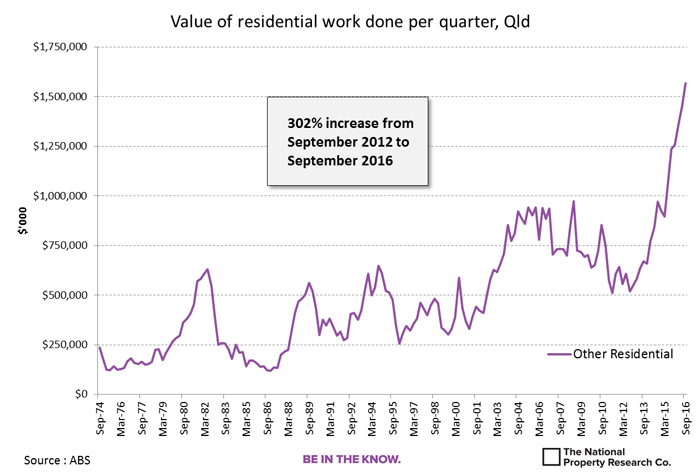 That denominator didn’t help that equation as we continued to struggle with our post mining boom reality and saw a negative GDP print in Q3. We were reminded in this final week of the ‘rock and a hard place’ scenario the government finds themselves in with regard to our coveted AAA rating. In May S&P put us on notice it was at risk. Our languishing economy is screaming out for Trump style fiscal stimulus on infrastructure, but to do so would seal the fate of us losing the rating and the political and real cost of that $1 trillion foreign debt pile increasing. 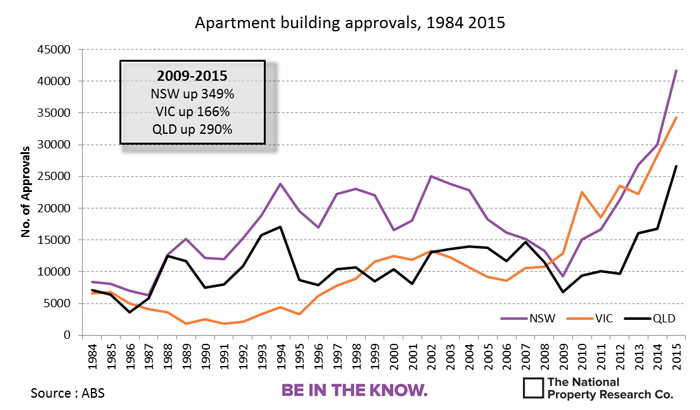 The looming apartment market crash and this rating will likely be key themes of next year for Australia. Globally we have more to come on the groundswell of anti establishment and anti globalisation movement with the Italian elections (sometime between Feb and May), French elections in April and German in September. Still in Europe and the number of ‘black swans’ in banking and debt markets continue to circle the skies. The Middle East needs no additional comment from us. But it will likely be the US that will hog the economic headlines as we see how the rubber hits the road with President Trump. When he is inaugurated it will mark the 3rd longest market expansion in history. How much is left in it? The US has $20 trillion in government debt and he wants to add $5t to that. How is that going to be passed and serviced? His muted policies have seen the USD and bond yields surge. How will that affect exports and housing? Last night he appointed the author of "Death by China" and "Crouching Tiger: What China’s Militarism Means for the World" (Peter Navarro who advocates a more aggressive stance in the ‘economic war with China’) to head up the National Trade Council. What will be the geopolitical ramifications? We could go on and on…. 2017 will be an incredibly interesting year and one with potentially huge volatility. Arguably never before is it as important to have your wealth truly balanced by including uncorrelated hard assets. So despite the gut wrenching precious metals correction since November we still find silver the number one performer for the year and only the S&P500 outperforming gold. Let us take this opportunity to wish you and yours a very Merry Christmas, a safe and enjoyable holiday and a prosperous New Year. Thanks too for your support and patronage this year. Whilst we reopen on 9 January we won’t be back with the daily news until the 16 January. Balance your wealth in an unbalanced world. Good morning and a happy new year to our readers. As our last news article of 2016 focused on the year that was, today we look ahead at the year that will be. To do this, we follow our 3 Wise Men theme from November’s Future Proof Portfolio seminar and provide some insight from another 3 wise men delivered over the break. The first is market cycle researcher and former Goldman Sachs employee Charles Nenner. In an interview released just yesterday, Charles comments on the Trump rally which has seen strong gains since the US election. Although Charles doesn’t see a sell signal yet in the equity markets, he is not taking on any new long positions as he is not seeing much more upside potential. This is an idea supported by the this morning’s AFR headline “Wall Street's faith that US President-elect Donald Trump's promised fiscal stimulus will spur growth and inflation is showing signs of flagging”. Two possible exceptions are the energy sector given an anticipated upside breakout in crude and consumer staples which he considers oversold. Broadly however, Charles is bearish because he sees most of the good news surrounding the anticipated fiscal changes in the US as being already priced into markets. Charles is “totally out of bonds” citing that most brokers who made a career in the bond bull market have never seen a bond bear market which he believes we’ve arrived at. Furthermore, Charles sees interest rates rising in 2017 but not substantially. He sees emerging markets doing badly, Europe struggling and the USD topping. 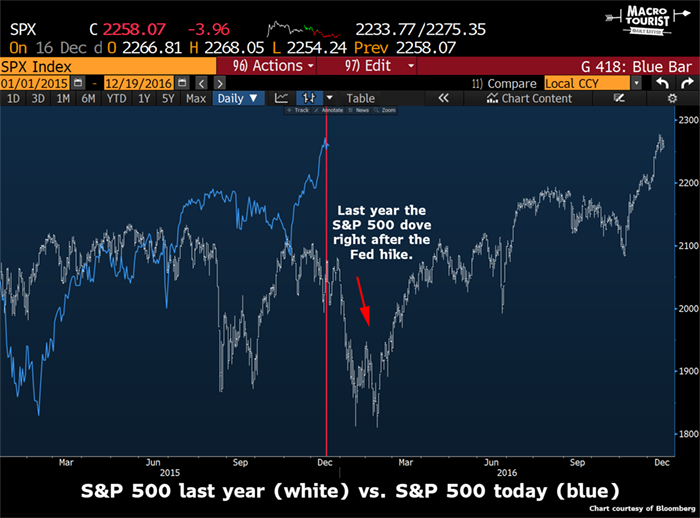 Based on his work in cycles, he is expecting a significant market pullback in the latter half of 2017 claiming that “the whole bottom is going to fall out” and says that it is likely to be “a drawn out affair”. Regarding gold, Charles sees prices rising albeit slowly, concluding that the low appears to have passed. “It’s a good idea” to hold physical gold and silver. In his closing words, Charles expresses sympathy for Trump as his inauguration coincides with a negative cycle and “those don’t usually work out too well”. Next we hear from Jeff Berwick of The Dollar Vigilante who has released a nice summary of 2017 to date. He notes that Bitcoin stole the headlines in the first week of 2017, gaining nearly $200 in the first 2 days of year before giving back those gains and more since. Gold and silver however have been performing nicely with gold starting the year at $1154 and rising to exceed $1200 recently. Silver has been similar, starting at $15.93 and coming close to hitting $17 since. Jeff reminds us that gold rose against all fiat currencies in 2016; rising 9% against the USD, 13% against the Euro and 31.5% against GBP, continuing its bull run from 2002 with only 2 down years in the last 15. 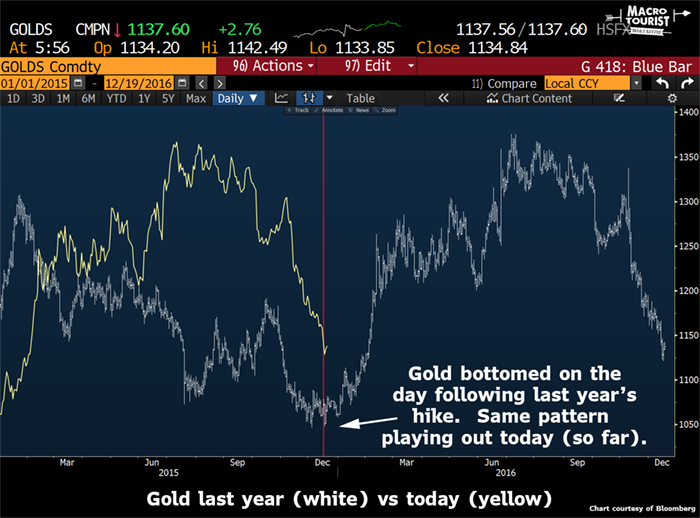 Jeff points out that gold’s rise in 2017 is somewhat correlated with the rise seen at the start of 2016 as pictured below. From the first day of 2016, gold and silver rocketed higher. Gold didn’t stop rising until it hit nearly $1400 in July. Jeff suspects that we may be looking at a repeat of that performance this year but given the geopolitics at play currently, he doesn’t see reason for the second half pullback experienced last year. Lastly, we bring you commentary from Bill Holter who writes for JSMineSet in collaboration with Jim Sinclair. Bill’s first two articles of the year discuss the theme “2017: The year of the truth bomb”. In an interview released on January 7th, Bill states that “the hologram that we’ve been living will end and the curtain will be pulled back”; referring in part to the Wikileaks revelations of late and the ultimate end to the relentless accumulation of debt required for current living standards. Bill suspects that Trump will preside over a bankruptcy stating that “credit is going to seize up, the US is broke, there’s nothing left unencumbered”. He goes on to say that “one man’s debt is another man’s asset. If the liability can’t be paid then on the other side of the balance sheet the assets have to be marked down”; a scenario not applicable to physical gold and silver. Credit will be a big theme this year according to Bill and “you’re already seeing the starting rumbles of it”. Bill reminds us that “the world turns on credit” and when credit dries up, he predicts an asset price pullback as a result of debt side collapses. In summary, there are many voices sounding warnings for the landscape in 2017 and with credit and counterparty risk identified as significant themes, diversification into physical assets makes sense now as much as ever. To continue our look at the year ahead from yesterday, we today summarise the World Gold Council’s 2017 forecast taking inputs from 3 more esteemed analysts, namely Jim O’Sullivan (Chief US Economist at High Frequency Economics, dubbed ‘most accurate forecaster in America over the past 10 years’ by MarketWatch), John Nugée (renowned economic and geo-political commentator and former Reserves Chief Manager at the Bank of England), and David Mann (award-wining economist and Chief Economist for Asia at Standard Chartered Bank). They list 6 main drivers for strength in gold this year. If you want to read the full report, click here, otherwise below is a summary. 2017 promises to be a turbulent year in geopolitics. On Friday we have the biggest wild card in history being inaugurated as the leader of the free world, we have European elections of the 3 major EU countries “against a backdrop of continued citizen unrest, fuelled by the ongoing uneven distribution of economic welfare.”, and of course Brexit actually happening. Interestingly the report doesn’t touch on the middle east… Are we becomingly numb to the constant threat this presents? Whilst the US looks set to continue to tighten monetary policy they believe we will likely see a divergence between the US and other parts of the world as ‘monetary easing’ continues elsewhere, devaluing currencies accordingly. “Exchange rates have historically been the key channel through which Asian economies have adjusted to higher US interest rates”. Whilst also mentioning Europe and the UK specifically we could we expect the AUD to fall this year too, seeing an increase in the AUD gold price. They also point out the continued buying of gold by central banks. Whilst nominal interest rates look to be on the increase (on both US Fed rate rise and bonds crashing) they may well be less than the growth in inflation and hence continued negative or low real rates. “An upward inflationary trend is likely to support demand for gold for three reasons. First, gold is historically seen as an inflation hedge. Second, higher inflation will keep real interest rates low, which in turn makes gold more attractive. And third, inflation makes bonds and other fixed income assets less appealing to long-term investors.” Surprisingly rising inflation was always going to be inevitable after all the stimulus via money printed or available for near zero rates for so long. They see this year as that playing out. We wrote at length last year about how historically overvalued the US (in particular) sharemarket is and how it is now the 3rd longest expansion in history. To date bonds have been the preferred safe haven for diversification against the inevitable crash but rising rates sees that less attractive. “In such an environment, gold’s role as a portfolio diversifier and tail risk hedge is particularly relevant.” Or as John Nugee says: “Portfolio resilience and diversification in the face of shocks will be key”. Tick tock tick tock…. Asian gold demand is generally consistent with increasing wealth. “The combined share of world gold demand for India and China grew from 25% in the early 1990s to more than 50% by 2016.” They believe Asia as a whole has reduced its economic reliance on the west since the GFC and will grow largely on domestic demand. They believe Asia will account for 60% of global growth in 2017. 6. Opening of new markets. Last night the British PM outlined her ‘hard Brexit’ plan which saw the FTSE drop nearly 1.5% or 107 points and the GBP surge, adding to the USD’s woes. Gold of course rose, now its 7th consecutive day of rises, the longest streak since last November. “In this context, the Bank of England will eventually need to bite the bullet and begin increasing interest rates if it is to keep CPI anywhere near the 2% target. Combined with soaring energy prices, this will place the brakes on growth. While a recession may not be in store in 2017, slower growth almost certainly is. If this unpleasant, “stagflationary” mix of sharply rising prices yet slowing growth sounds a bit like what occurred in the 1970s, that’s because it is. The fact is the UK has been living on borrowed time and borrowed money ever since the financial crisis struck in 2008. Sterling devalued sharply back then as the Bank slashed rates to zero and began QE. These “emergency” measures, now in place for over eight years, have kept the economy on life support by subsidising a huge expansion of debt, public and private, and the associated property bubble. They have not created the necessary conditions for a truly self-sustaining economic recovery. Indeed, the opposite could be argued, that by keeping the monetary spigot open for so long the Bank has encouraged debt-fuelled speculation rather than a salutary economic de-leveraging. As the Bank finally moves to raise rates in response to sharply higher inflation, bond yields are likely to rise and share prices may well decline or, at a minimum, fail to keep pace with the cost of living. The much-maligned British saver, suffering for years from artificially low interest rates, is only going to find things getting worse as portfolio valuations decline. Borrowers, meanwhile, will find they are tapped out. This may sound like a familiar set up to Aussies as well…. As you can see from above, his model (as at June 2015) is by far the worst forecast for the next 10 years at an average return of MINUS 9.39%. 10 years is a good long term investment horizon (the standard advice is take a 7-10 year investment horizon for any decision). So to be buying the S&P500 now you could expect on average to lose 9.4% of your money. The S&P sneezes and our sharemarket catches the same cold. Alternatively gold, an historically uncorrelated asset, in that time could be expected to have healthy gains as the shares fall. More specifically, over 10 years the reality to achieve that -9.4% average would be, say, a 50% drop on a sharemarket crash and only a partial recovery within that period. What might be a prudent strategy would be going overweight gold/silver now, profit-take on the sharemarket crash gold rally, and then deploy into those (then) cheap shares. Win win. There’s an old business adage “There is no new way to go broke, it is always too much debt”. As applicable to governments as it is to businesses and individuals, that is the challenge before the world today. Debt can either be repaid through surplus earnings, defaulted on or effectively eroded through inflation. As governments seem unable to deliver anything but deficits the first option is off the table. In our new globally interconnected world so is the second (look at the efforts by its sovereign creditors to keep little old ‘unimportant’ Greece afloat). That leaves the third; inflation. We’ve written of this before and it won’t be new to regular readers. The inflation scenario is only really effective if it delivers negative real rates – i.e. inflation is higher than the nominal interest rate. That has been the case for most developed countries around the world for some years now though to date they have struggled to get any kind of inflation despite near zero rates. Some are even ‘hard wiring’ it through making the nominal rate negative (ala Japan, EU, Swiss etc). The sad irony is it has encouraged record debt accumulation taking advantage of the (now) low rates. What happens when those rates rise on all that debt?? “The December CPI report saw headline inflation rise for a 5th consecutive month up 0.3%, and up 2.1% from a year ago, the highest since June 2014. Of note was rent inflation which rose a whopping 4.0% in December, the highest annual increase since December 2007, pushing shelter inflation up 3.6% Y/Y. When an economy remains moribund (and so wage growth) whilst inflation rises everyone hurts, not just the savers. “Mr Valli proposes four options - a series of increasingly large inflation surprises with accelerating inflation; steady negative real rates with a stable inflation rate; a one-off surprise inflation jump; and higher inflation that is more than offset by a rising inflation risk premium. For Option 1, he suggests a real rate that starts at zero and falls by 1 point a year (-1%, -2% etc). This would reduce the debt-to-GDP ratio from 100% to 60% within 12-13 years but at the cost of very negative real rates (-12%) by the end, which look implausible. For Option 2, a steady negative real rate of -5% would take 25-30 years to cut the ratio from 100% to 60%, but at -4%, it would take 100 years. For Option 3, a one-off inflation shock would have to be 40% plus in a single year to get the needed effect, which would have other consequences. Negative real interest rates is where gold truly shines. Economic crises (likely triggered by too much debt) are where gold truly shines. Hands up who thinks governments around the world are going to start delivering surpluses any time soon?